From a bit of crazy caped fun for a generation raised on wizardry, quidditch as a sport is evolving and striving to be taken seriously. With the final contest of the season looming in Queensland this weekend, Jack Banister checks out the form. When Harry Potter played Quidditch, it was usually on bleak British winter days. On a sunny Sunday in Melbourne’s inner south-east, there’s not a real wizard to be seen in the blue skies over Fawkner Park, though several muggles are running around on the ground with poles between their legs. It’s the poles and the three hoops at each end of the pitch that pique the interest of passers-by. The biggest event on the Australian quidditch calendar is the national championships, known as the QUAFL. The 2018 instalment of the club-based tournament will be held on the Sunshine Coast this weekend – December 8 and 9 – so Victoria’s contenders have organised a day of practice matches to help them prepare. Among the favourites to win the QUAFL trophy are the Melbourne Manticores and the Whomping Willows, who will be joined at the tournament by the La Trobe University La Trolls, Melbourne Ravens, the South Melbourne Centaurs, the Brisbane City Bin Chickens, and a host of other teams from across Australia. If there was a prize for the best team name, it would have to go to the University of New South Wales Snapes On A Plane, although the Australian national team, known as the Dropbears, runs a close second. Nicola Gertler, 24, plays as a beater for the Melbourne Manticores, and is also the president of the Victorian Quidditch Association (VQA). After seven QUAFL tournaments, the sport is looking to gain more legitimacy in order to continue its growth. That aim has meant that the game has distanced itself from the wizarding version, a move Gertler says has allowed quidditch to attract better athletes. “We try and run it very much like any other kind of sports league and try and distance ourselves from Harry Potter as much as possible,” she says. When the sport first came to Victoria in 2011, the players were dressed in robes and capes, which Gertler says looked “so stupid” and were also a huge safety hazard. “In the past two years, pretty much every Victorian team has redesigned their uniforms to make them less cartoony,” she says. The players now wear simple, short-sleeved playing shirts, and plain sports shorts. Without the poles, they wouldn’t stand out from other sporting codes one iota. Gertler joined the sport in 2013, and became more and more serious as her time at Monash went by. She moved to the Manticores when she graduated, and became VQA president in 2017. “When I started uni at Monash, my friend, Clementine, and I, we joined the Harry Potter club and we found out they had a team, and we just started going down to the trainings. At that stage, it was very casual,” she says. As a friendly match begins on the pitch at Fawkner Park, Gertler shares the sport’s origin story. A group of Potter-loving students at Middlebury College in Vermont in the United States dreamt up the idea of adapting J.K. Rowling’s version to suit the magically incapable. Many of the well-known aspects of Rowling’s Quidditch are untouched in the muggle version, which is traditionally spelt with a small q for the sake of clarity. Games are seven-a-side, with each team made up of three chasers, two beaters, a keeper and a seeker (see panels, right). Play usually focuses around end of the playing area – like basketball – but because of the bludgers being hurled around, it’s hard to know where to look. Other than the obvious fact that no one is airborne, one key divergence is that rolling substitutions are allowed. Another is that quidditch is full contact, which is unusual for a mixed gender sport. “There’s a rule in the book which comes under excessive force. But quidditch has come to a level where everyone has got a really good understanding of the community and the expectations that we have for each other,” Gertler says. Along the sidelines of the pitch, players from different teams relax, socialise and watch the match that’s now unfolding on the pitch. Many have planned for the day, bringing packed lunches, deck chairs and picnic rugs. The vibe is comparable to that of an Ultimate frisbee competition, another mixed gender sport. Teams in quidditch have to make sure they have no more than four men or women on the field at any one time. “The best teams are the teams that can utilise all of their players, regardless of gender,” Gertler says. 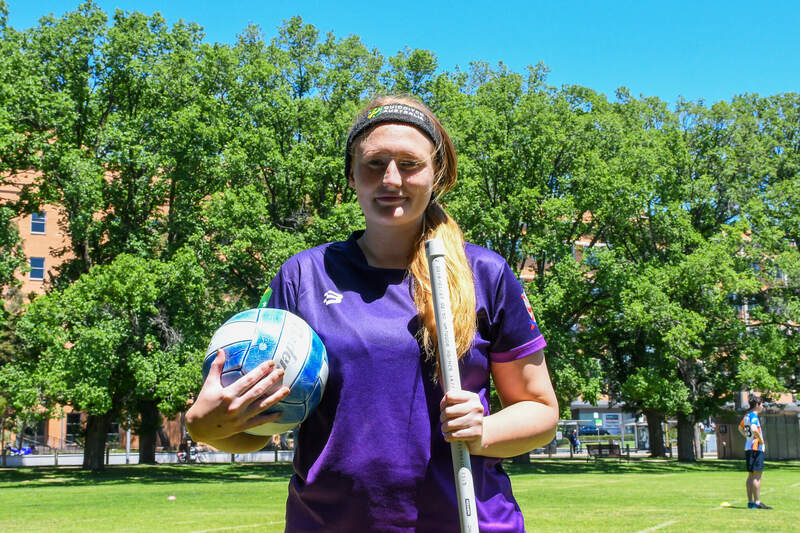 For Emily McKie, a 24-year-old chaser from the Melbourne Ravens, that mixed gender element was the key reason she joined the sport for the 2018 season. “I’m a not massive fan [of Harry Potter]. I’ve read the books and seen the movies, but it’s not what drove me to play,” McKie says. McKie played cricket and indoor soccer against the boys when she was growing up, and being able to beat them still motivates her. “I like setting that bar and showing we’re not just the extra players on the team, but some of us girls can really be a physical presence,” she says. The game gets even more frenetic after 18 minutes, when a fifth ball – the famous golden snitch – is released onto the field. Gertler says that before this grand finale, the teams tend to score between 50 and 100 points. The core rules haven’t changed since the game was first conceived by those Middlebury students. By 2010, 46 teams played in the U.S. national tournament. By 2011, the first edition of Australia’s QUAFL was the first major tournament held outside of the US. The first world cup in 2012 cemented the sport’s status as a global pastime. Ditching the Comic-Con feel – the robes, capes and broomsticks of the early games Gertler saw in Australia – was crucial to the sport’s growth, and has meant that there are now more and more players like Emily McKie, who aren’t just superfans. “You have players who have no interest in Harry Potter, they just want to come along and a play a really intriguing sport,” Gertler says. Mark Kelly, 25, originally came to play as a ring-in because of a late-withdrawal. “I’ve seen the Harry Potter movies, but it’s not a particular interest. It wasn’t Harry Potter related at all for me,” Kelly says. One game was enough to hook him. He’s now the captain of the South Melbourne Centaurs, and also commentates on local and international events. “The game is complex, and I really found that fun. There’s a lot to know about this game, and I’ve seen it change a lot over time. People are still trying to work out the best way to play,” he says. Quidditch Australia aims to have the game recognised by the Australian Sports Commission, but they need five thousand members. According to Gertler, there’s about 1000 players in Australian at present, so she acknowledges that ASC recognition is a long-term goal. McKie says that her team, the Ravens, are the best sporting club she’s been involved with, and that she doesn’t expect growth to hurt the sport’s strong community feeling. “The community has always been the emphasis in quidditch and people are still continuously trying to maintain that … that’s been instilled since day dot, and it should continue,” she says.